As the improvement district pends, some at Temple have spoken out against it. The North Central Neighborhood Improvement District proposed for the area surrounding Main Campus is supported by Temple, but is not without its fair share of dissenters. One of the most outspoken residents against the improvement district is Vivian VanStory who is the president and founder of the Community Land Trust Corporation, a nonprofit organization in North Philadelphia. While VanStory and her organization oppose the NCNID, William Bergman, vice president and chief of staff at Temple, is listed as a board member of the CLTC. VanStory said when she was gathering support for the organization, she approached Bergman, who said that he’d like to be part of it. Ray Betzner, assistant vice president of university communications, said after a conversation with Bergman that he is not part of the board, which VanStory refutes. Bergman has not responded to multiple requests for an interview by The Temple News. Although confusion has risen from Bergman’s position with the CLTC, other people affiliated with Temple have come out against the NCNID. James White, trustee and former executive vice president, testified against the bill at a city council hearing on March 13. 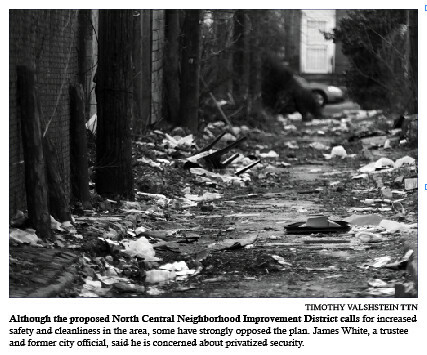 White, the former managing director of Philadelphia, listed numerous reasons for his opposition to the bill, including the supposed improvement of security in the neighborhood, which is allotted $75,000 of the district’s $450,000 initial budget, according to the bill. White, who added he was not speaking on behalf of Temple, said that revenue accumulated to fund the district would not be sufficient to add additional police patrols to the area and said he did not approve of privatizing security in the district. While White listed security as a main source of his opposition to the NCNID, he also said that relations between Temple and the community have been damaged as a result of the NCNID. White said at the March 13 council hearing that the process has been difficult for those on both sides of the issue. The bill faces one more public hearing on May 3, at 1 p.m., before a 45-day period in which the bill can be voted down by a negative vote of 51 percent of affected property owners. Betzner said Temple still supports the bill and is expected to make a significant contribution to the district, though it has not been announced. VanStory added that she still continues to gather petitions opposing the bill in order to garner the necessary votes to stop the legislation. Sean Carlin can be reached at sean.carlin@temple.edu. Trustee to own local news orgs. The move follows the university’s decision to delay submitting its on-campus stadium proposal to the City Planning Commission.